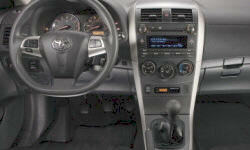 See TSBs and recalls for the 2011 Toyota Corolla. 26040 mi Engine light came on and at same time car was noisy and gear changes not smooth. Brought car to dealership and told there had been a transmission problem leading to a recall that we weren't aware of. Problem fixed the same day, no charge. C $150 The battery had to be replaced as it would not hold a charge. Service manager thought it might be because some plate was shorting out. C $35 Had a rattle under car. Turned out to be the heatshield. Rusted out around screws. Dealer refastened with large washers and new screws. 24700 mi Ticking sound under acceleration. Dealer replaced both VVT cam gears. Problem fixed. 64000 mi Clicking sound from front pads....back brakes had thumping noise. Dealer said nothing they can do (bull) and wait till the pads need to be replaced. 1200 mi Odd transmission shifting (possibly fuel cutoff). Hardly noticeable but found TSB that described the issue perfectly, asked to have it applied. Nov 2011 Computer recalibrated to correct slight engine surging while driving. US $16 Three attempts made to start car, engine turned over but would not start. Shop ran diagnostic and did not find a problem. Cleaned fuel system. Items broken, but not worth the cost of repair: the driver's foot rest came loose from the mount, the passenger's sun shade mounting bracket broke, the center console storage door broke, and the passenger's door guard has come loose. Replaced car antenna. Rusted out. US $149 Replaced rear window tinting due to bubbling. US $1311 Remove and replaced lower control arms and CV joints. US $190 Standard brake service on front brakes. US $1307 Shock and strut replacement. That the old ones were worn was noticeable in the handling. See our lemon odds and nada odds page to see vehicles with no repairs or vehicles with more than three repairs. 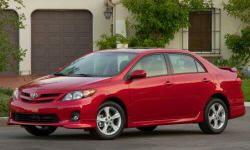 To see how frequently 2011 Toyota Corolla problems occur, check out our car reliability stats.